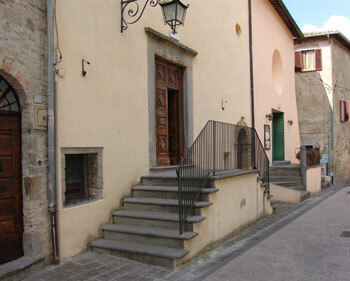 Since 1100, this church placed in Corso Garibaldi worked as a hospital with the name of “Hospital of St. Lazarus”. 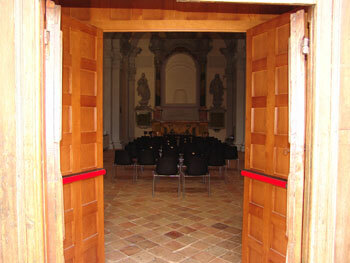 For the will of Ranieri degli Olivi (which was the rival family of the Fortebracci), it probably merged with the old hospital for lepers and travellers which was located in the parish church of St. Gregorio; moreover, it was ruled by the Venerabile Congregazione di San Fedele, which its name comes from. The building still exists, although it lost its role as a church and it has been converted into an Auditorium. The Church had only one nave and on the altar there was the “Annunciation” by Tommaso Bernabei known as Papacello, which can now be seen in the Pinacoteca Comunale. In the two side altars, in dedicated niches, statues of the risen Christ and St. Rocco were venerated, which are now kept in the Collegiata. 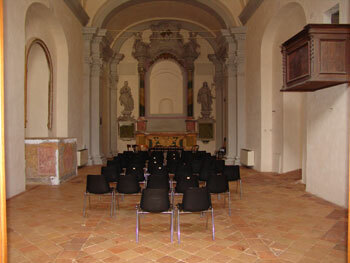 In the adjacent cloister to the Church of St. Fedele operated Suor Serafina Brunelli, a Benedictine mystic.